In my post, I am going to discuss Traffikar, a relatively new product from James Renouf and Jeremy Kennedy. It launched in mid-February 2017. It promises to show you an “effective new way to get traffic and engagement”. I think that is music to every internet marketer’s ears. But does this product live up to the promises the vendors are making? I have read a few positive reviews and decided to purchase it and put it to the test. So before you are going to get this product for yourself, I recommend reading my review. Is it worth the money and how did it work for me? When I heard about this product, I was really excited but skeptical at the same time. Targeted traffic and engagement in within 24 hours that sounds too good to be true, right? But truth to be told, James and Jeremy are onto something. And you can hear their excitement in all of their videos that come with this product. The cool thing is that you are purchasing a downloadable pdf with 11 videos for under $15. That is pretty good value for money. Having the PDF means to have easy access to it all the time with no account or password required. James and Jeremy are showing us in their video course step-by-step how to drive highly targeted traffic to any (niche) website. They are explaining the whole process in an easy to follow way. I don’t want to reveal too much since they have put quite a bit of work into developing this course. All I want to say is that you will leverage Instagram as a social media platform. Instagram has become hugely popular over the last few years. Right now you have zero competition. People are going to learn soon that this IS the way that we need to market going forward. You, however, get to be there right at the beginning. Sounds pretty good. Let’s have a closer look at some more details. Traffikar is suitable for beginners and advanced marketers alike. As mentioned before the videos are easy to follow and it does not really take rocket science. I like that there are two case studies included as well. Unlike PPC which requires quite a bit of knowledge to get best results, you don’t need any experience with social media. I think as an online marketer it might be worth to check this course out and see if it is beneficial for your website or blog. Who doesn’t want to get traffic on demand at any time? I still think though that the success rate depends on the niche you are in. 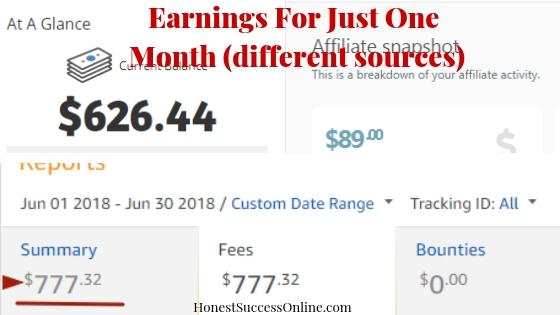 As I will discuss in my case study, I am in the Make Money Online Niche, and there are not too many Instagram accounts with great followers in this particular niche. So I felt my options were a bit limited. The most popular niches on Instagram are Fashion, Health, and Fitness, Nutrition, Music, and Nature. This training course comes as a downloadable PDF with 11 videos including two case studies. James explains the process of how to get Instagram on your desktop which is helpful. A new way of driving traffic to your site. You have to pay money to drive traffic to your site from Instagram. It starts at around $5. So if you don’t want to spend money on it, then there is not really much point of learning about this method. There is no way around it. I am not keen on the upsells. As soon as I purchased the course, I was asked to buy an upsell which I found a bit annoying. I don’t even know what would be included in these upsells. Videos could be a bit more structured and professional. Following the instructions from the videos, I went ahead and invested some money in buying a ‘Shout out’ from an Instagram account which has a following of over 101 000 followers. I also opened an Instagram account for my HonesSuccessOnline site. Why not gaining some followers on Instagram as well, right? My goal was to drive traffic to a particular post on my website. The shout out was limited to 24 hours. That is how long the website link gets posted on the chosen Instagram account. You can choose differnt options. The longer the more it costs. The result: I had only twenty-two visitors coming from this link on Instagram which I found was a bit disappointing. I feel it might be better to drive traffic to a Landing page to capture email addresses instead of sending them to a particular post. You also need to post an Image and make it as enticing as possible. Instagram is all about captivating images. Overall, I’ve hoped for more traffic and more engagement through this ‘Shout out”. In the future, I will try again but with focussing on capturing email addresses. 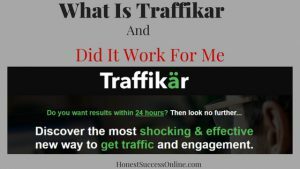 The method shown by Traffikar is a legit way of driving traffic to your site, landing page or whatever it is you want to promote. There is no doubt about. It’s not free traffic; you still have to invest money to buy ‘Shout out’s.’ I still think it is good to know about this method and try different ways. 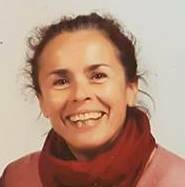 My primary focus is of course on getting free traffic through social media and organic searches. That is, obviously, more sustainable in the long run. But if you want to kick off building your email list or want to promote a certain product, I’d say using James and Jeremy’s method is better than using a PPC campaign. Is it worth the money? Well, you will have to answer this question for yourself. As outlined before, there are pros and cons. I for myself learned something new and will definitely give it another go. I’d love to hear your questions or feedback. Please let me know in the comment box below.